Several friends have heard me promoting the 10-day Real Food Pledge we’re starting this weekend as a family. Several of you have decided to “take the challenge” with us and give it a try with your families. Your interest has motivated me to go out to local sources of real food and invite them to support us in this pledge. Their responses have been overwhelmingly positive… and generous! 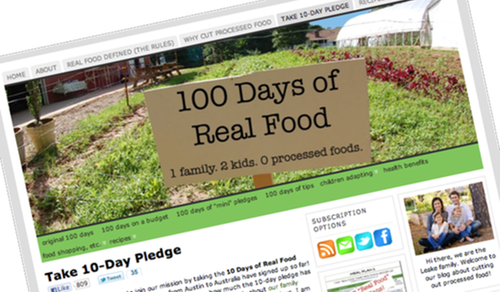 So now I need an accurate head count of how many households plan to participate in the 10-day Real Food Pledge. Go to the blog that inspired our challenge, read the rules, and Take the 10-day Pledge. Leave me a comment on this post or send me an email with the count of adults and kids in your house taking the pledge. I’ll post more information about our “sponsors” as the details become finalized. I’m excited we’re taking this pledge together! 17 Responses to Real food. Who’s in? My family and I are in! Love the blog!! Yay! Any chance you have a Chipotle restaurant near you? What about Great Harvest Bread Company or Earth Fare? I can send you the same goodies we’ll be using here! The Kelly’s are in too! We are in. Excited, but nervous too! We’re on board, but as it inches closer, I’m getting more nervous!